A journal devoted to sensory, consumer and behavioural research in food and non-food products. 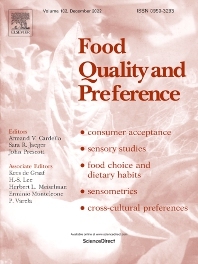 Food Quality and Preference is a journal devoted to sensory, consumer and behavioural research in food and non-food products. It publishes original research, critical reviews, and short communications in sensory and consumer science, and sensometrics. In addition, the journal publishes special invited issues on important timely topics and from relevant conferences. These are aimed at bridging the gap between research and application, bringing together authors and readers in consumer and market research, sensory science, sensometrics and sensory evaluation, nutrition and food choice, as well as food research, product development and sensory quality assurance. Submissions to Food Quality and Preference are limited to papers that include some form of human measurement; papers that are limited to physical/chemical measures or the routine application of sensory, consumer or econometric analysis will not be considered unless they specifically make a novel scientific contribution in line with the journal's coverage as outlined below.